Churches are home to an extraordinary range of artworks. More medieval art in Britain is found in churches than in museums, whether as paintings, sculpture or stained glass, and the value of more modern site-specific artwork in churches has often been overlooked. These unknown galleries of art in churches are found in city centres, outer suburbs, towns, villages, the coast, the mountains and the open fields. Without better research and interpretation these treasures of art, ancient and modern, will remain unidentified and marginalised, and increasingly at risk. Examples of work associated with important names in the history of British art, such as William Morris, Edward Burne-Jones and John Piper, are rightly celebrated, but much of quality and variety might also be found by now largely-forgotten Victorian sculptors that were celebrated in their day, or by the best artists of the Arts and Crafts Movement. All of these works, whether imposing or modest, painting, sculpture and stained glass, have resonance as cultural artefacts, since they are private and public commissions intended for community spaces. 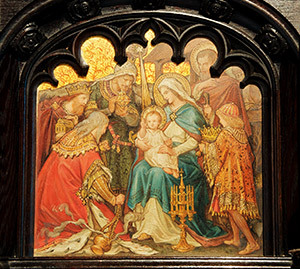 Surrounding the images, the decorative arts and architecture of the church is similarly rich. Victorian architects, once reviled as the despoilers of medieval church fabric, are now being appreciated for their achievements, while a few of the studios that worked for them, producing ecclesiastical furnishings and architectural sculpture, are only slowly being recognised. The ‘Imaging the Bible in Wales’ project (2005–8) proved to be a formative excursion into ecclesiastical art of the nineteenth and twentieth centuries. This work led on to the ‘Stained Glass in Wales’ project (2009–11), and the two online databases of both projects attract around 2000 visits every month. In 2014 I established Sulien Books to produce guidebooks for churches, drawing together my work as a historian, photographer and designer in the interpretation of the visual art of the church.